A long time ago, my family started a beautiful tradition. All my sisters, their children and friends of the family meet at my mother’s house in the countryside to celebrate carnival. 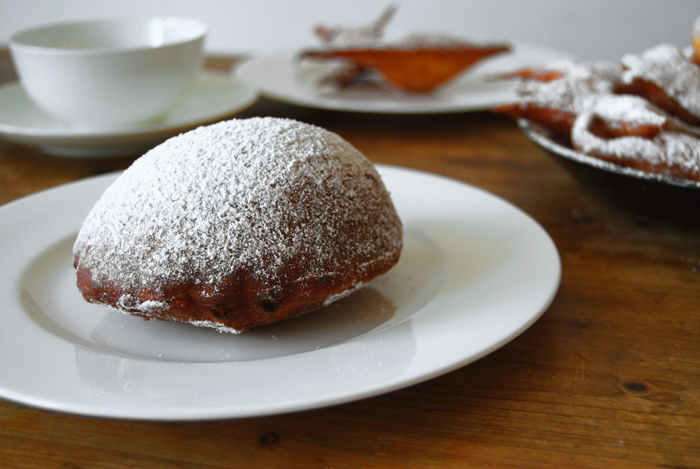 We listen to silly carnival music, the children dress up in funny costumes and we make huge amounts of a special traditional carnival pastry – the famous “Berliner”. When the sweets are done, we fill them in my mother’s large white bowls from Tuscany, place them on her long table and enjoy the fruits of our work, which usually goes on for hours. In general, I can’t say that I’m too fond of the 5th season (the name given to carnival time in Germany) but the mood and the food at my mother’s home makes me love it! 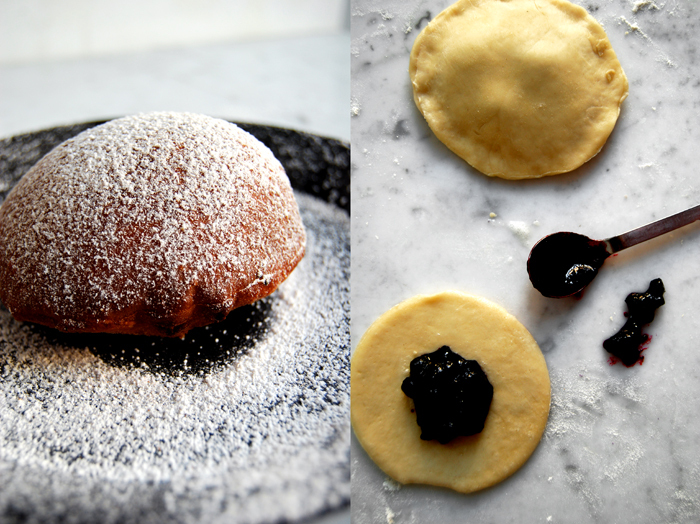 The sweet speciality we make looks a bit like a doughnut without a hole, it’s made of yeast dough, filled with jam and deep fried in vegetable shortening. It has different names in different regions but where I come from, which is the center of carnival in West Germany, they are called “Berliners”. Funnily enough, they are called “Pfannkuchen” in Berlin, which means pancakes. In the Swabian area in the South of Germany where my step father comes from, people call them “Fastnachtskuechle”. I could continue endlessly with even more names “Krapfen”, “Kreppel”, seemingly every region wanted to give them a name of their own. So we all gather in my mother’s kitchen and each of us has a specific job to do in the making of our “Berliners” – which never changes. For years now, my job is to watch the sweets together with my step father while we fry them in a large cast iron pot. We have to turn them and dust them with sugar when they are done. My mother and sisters, on the other side of the kitchen, take care of the dough and filling the “Berliners”. On my photos you can also see some free shaped sweets which are the bits and pieces of dough that are left after cutting out circles. 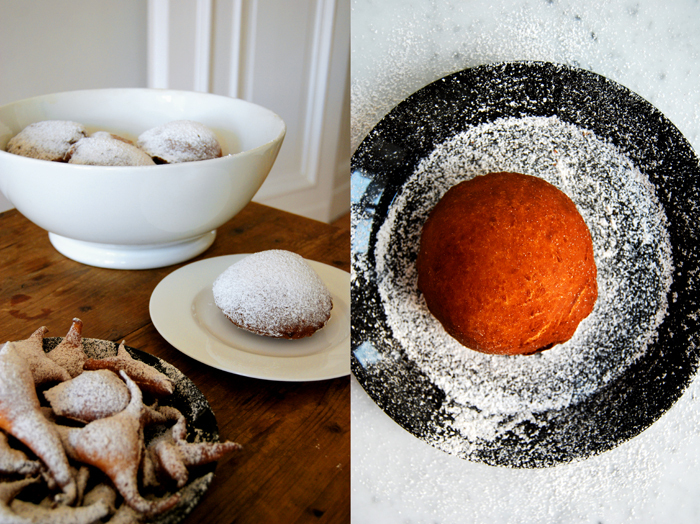 Carnival is still a month away (and I’m also not at my mother’s house at the moment) but there is a reason I made my own “Berliners” at my home now. I was asked to participate in a blog tour with 13 other blogs from America and Australia and write about “Hearts At Home”. My heart is always where good food is and that’s at my home most of the time but also at carnival at my mother’s together with my family. Our tradition, to meet at this time and to make this special food means a lot to me. I look forward to seeing my loved ones and spend a few wonderful, silly days together with them. That’s where my heart is and that’s home to me. Making “Berliners” without my family was still a fun experience. I was a bit worried that I wouldn’t manage on my own but I did, and even more so it was surprisingly easy which makes me think about having this adventure more than just once a year! Below you can find all the other great blogs who wrote about their own personal view on “Hearts At Home”. 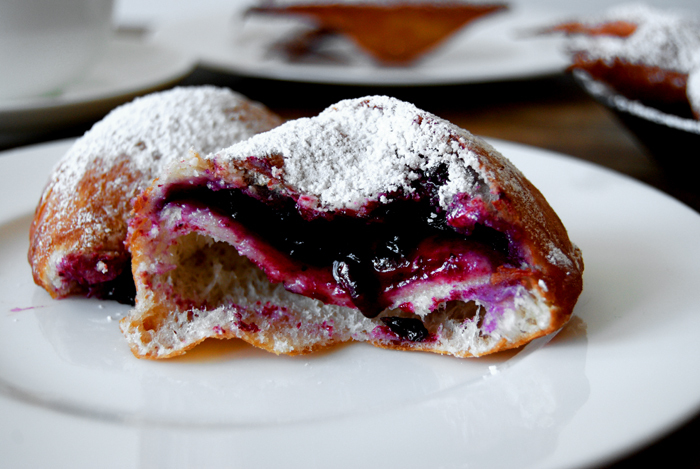 I made 12 jam filled “Berliners” plus several free shaped sweets (without filling), all in all of 500g / 1 pound of flour. I melted 1kg / 2 pounds of vegetable shortening for deep frying in a large pot, enough to allow the sweets to float freely. My mother uses a much bigger pot and 3kg / 6 pounds of shortening but she starts off with 3kg / 6 pounds of flour as she has to feed more hungry people than I did. Combine the dry ingredients, add the milk and butter and mix with your dough hooks for 5 minutes. Continue kneading and punching with your hands until you have an elastic dough ball. Put the dough back into the bowl, cover with a tea towel and let it rise in a 35°C / 95°F warm oven (top / bottom heat) for about an hour. When the dough has doubled in size, take it out, punch it down and knead with your hands for 2 minutes. On a floured working surface, roll the dough out in batches and cut out 10cm / 4″ circles (I used an old tea cup from my grandmother). 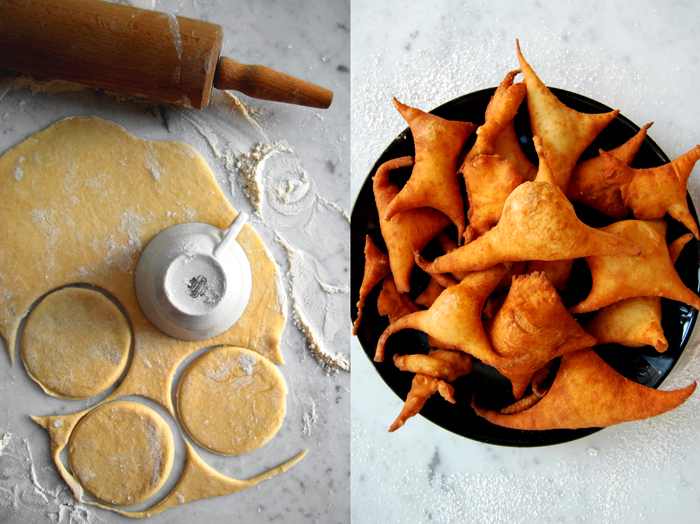 Put the bits and pieces of dough which are between the circles aside as you will fry them as well (without filling). Heat the shortening in a large pot on highest temperature. 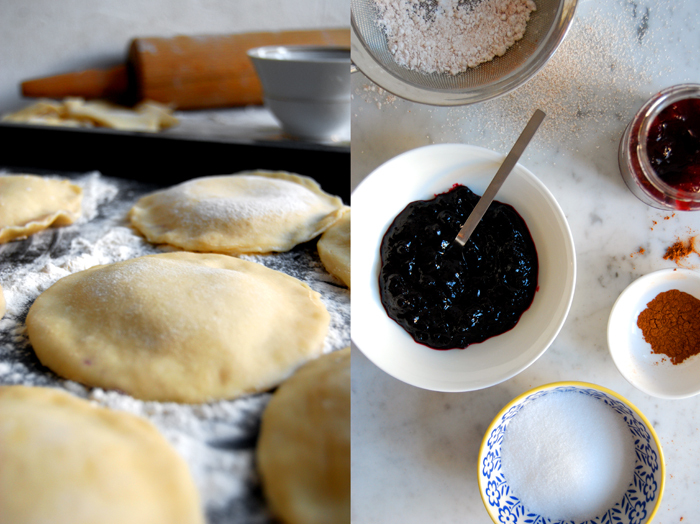 Take one disc of dough, drop a teaspoon of jam in the middle and brush the edge with egg white. Put a second disc on top, sealing well by pushing with your fingers along the outline twice to make sure that they won’t open in the hot fat. To check the temperature of the fat, put a piece of dough inside, carefully as it’s very hot! Turn it with wooden spatulas or spoons, it should be done within a few seconds. The “Berliners” might take a few seconds longer. They will become a bit dark, that’s normal, but they shouldn’t burn, so adjust the temperature if necessary. Keep in mind that if it’s too low the inside won’t cook through. I always cut the first “Berliner” in half when I think it’s done to see if I have to change the setting. When you take them out, let them cool for a few seconds before you dust them with your cinnamon icing sugar. Meike, I’ve enjoyed meeting you this week and adding you to my bloglist. Your blog and your recipes are so lovely. 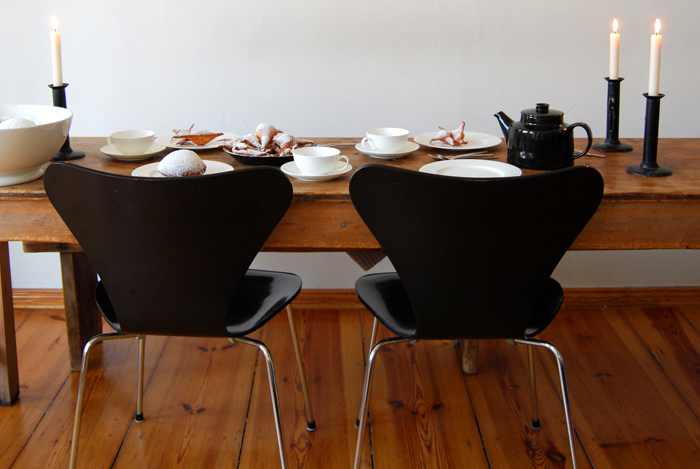 Your Berliners look delicious and I agree with you, food has a wonderful way of turning a house into a home. I love a home where the kitchen is the heart of the home and everyone feels comfortable gathering there. Thank you for your sweet words Kerryanne! The food I cook (or bake), my kitchen and my friends and family enjoying it, that’s home to me! I’m very happy I met you and the other girls through this blog tour, it was great! Oh wow- those look so delicious!! I am getting hungry!! 😉 Love your beautiful photography too! Thank you Kelly, I’m happy to be a part of this tour! I didn’t know you and your husband have German roots. In some regions carnival is called the fifth season (like the Cologne area where I’m from), it starts on the 11th November at 11:11am. It’s like a “parallel” season. In Munich for example, it’s the feast of a special beer drunk during Lent. It’s always connected to religious or traditional events. Where are the two of you from? Yum! Those look really tasty! Hi Ann, it’s true! We love cooking (and eating) together with friends and family. I’m happy you like my blog, thank you! It’s great that we all met through this blog tour! Meike those look so delicious! Beautiful photos! Thank you Anne! Enjoy your weekend! Meike, These look wonderful! Your story made me think about my dad’s family and their Norwegian baking traditions. 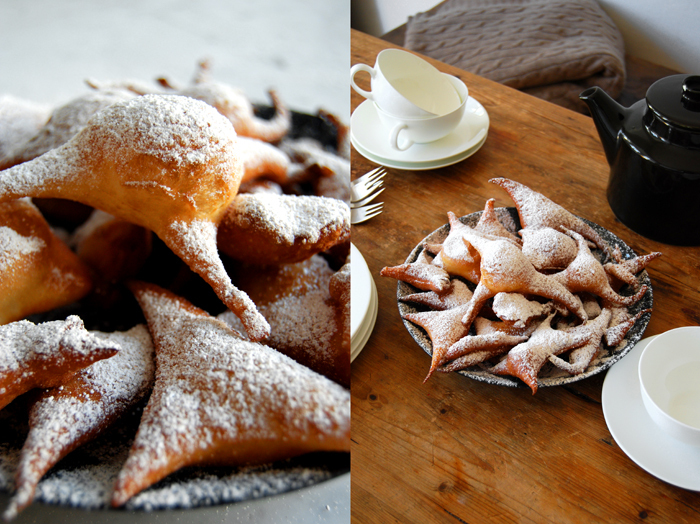 My grandmother used to make the most wonderful pastries similar to your Berliners. So delicious! My husband travels to Germany about 4 times a year for work (to Waldorf & Heidelberg mostly) maybe I’ll tag along one day soon and get to meet you! Hi Julie! Thank you! These kind of sweets are so popular all over the world – baking connects people, that’s wonderful! I’d love to meet you and show you Berlin, that would be great. I used to live close to Heidelberg before I moved to Berlin, it’s beautiful there. You should join your husband one day and then we all meet here at my long table and I cook for us! Meike, I read your blog every day. Fantastic recipes as well as photos. I am an American living in Peru for the past 7 years. In this recipe for Berliners when you refer to vanilla sugar in the recipe do you mean powdered sugar? Thank you Sheila, that’s so sweet of you that you follow my blog every day! Vanilla sugar is made of sugar and vanilla beans. In Europe you can buy it pre-packaged, you use one package (8g) for around 500g / 1 pound of flour. You can make your own vanilla sugar by mixing 2 cups of sugar with the seeds of one vanilla bean, or replace the vanilla sugar with a pinch of vanilla seeds or vanilla extract. Thank you so much. I will have to make this myself since they don’t sell vanilla sugar here. Wonderful!! We spent 7 wonderful years in Berlin when I was a teenager and enjoyed “Berliners” every New Year’s eve with Champagne at midnight. There was always a trick one filled with mustard (traditional). Thank you Laura! That’s so nice that your husband’s family has a similar tradition! I’ve never heard of coliches. There are so many names for these kind of sweets as they are so popular all over so world. I love that hey are so easy to make, especially when you’re together with family and friends, it’s fun! Meike- those look amazing! My husbands family has a tradition to making something very similar called coliches. I realize it is not so much what they were cooking but they were doing it together…with love. Your photos are amazing and I am looking forward to coming back to your blog to visit.